Enter Jurassic World with your child and recreate all the drama and tension from the movie, with this exciting set! There’s a T. rex on the loose and it’s snapping its jaws! Preschool children will love to help Owen Grady speed in with the car, face off with the huge dinosaur and make it safely into the lookout tower to call for backup. This easy-to-build dinosaur toy with large building bricks is great for creating endless role-play stories with a dinosaur theme. Includes an Owen Grady LEGO® DUPLO® figure, plus a T. rex figure. Price is 36% below the initial Lego retail price, a € 10.93 discount! This comes down to 86.64 cent per brick. The T. rex Tower (10880) Lego set is available from the sites below. However, they do not offer delivery to your selected region. The T. rex Tower (10880) Lego set is no longer directly available from the sites below. However, 3rd party partners of these sites might still have the set available. Alternate description Help Owen Grady get the escaped T. rex under control in Jurassic World! 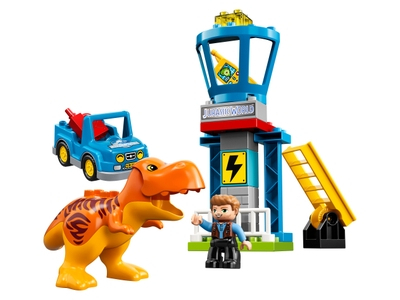 Includes an Owen Grady LEGO® DUPLO® figure, plus a T. rex figure with opening jaw. Features a car and a Jurassic World lookout tower. Accessory elements include a cell phone, petrol can and a hinged ladder. Help Owen Grady save Jurassic World from a T-Rex on the loose! Drive to the rescue in the car and call for backup with the cell phone! Play out exciting role-play stories based on the Jurassic World movie. Help your child master basic construction skills with this fun dinosaur toy. T. rex measures 4” (11cm) high, 6” (17cm) long and 3” (9cm) wide. Car measures over 2” (6cm) high, 5” (14cm) long and 2” (7cm) wide. Lookout tower measures 9” (24cm) high, 3” (9cm) wide and 2” (6cm) deep.